[Standard Length ] 6ft(2M) and 10ft(3M) lightning cables are perfect for charging iphone, ipad on the bed, at the airport or in the office from long distance, easily carry this light weight cable wherever you go. [Nylon Braided] Highest standard of quality cables, covered by premium quality braided nylon jacket. 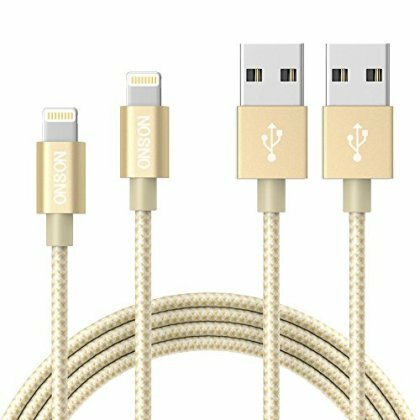 ONSON cables are durable enough to withstand heavy usage, but still in great performance without any change. [Great Charging Performance] Sync and charge at the same time at the fastest speeds on your windows PC or Mac. Its durability, connectivity, combatibility, and performance is 100% Gauranteed. [Compatibility] Compatible with iPhone 7/7 Plus,6/6S/6 Plus/6S Plus,5/5S/5C/SE,iPad,iPod Nano 7,iPod Touch. [Warranty Policy] Every sale includes an 12-month, worry-free guarantee to prove the importance we set on quality. If you have any quetions, don't hesitate to contact us!